Sporadic Sentinel: Oregon Ducks Football Week Two: College Football Playoff Preview? 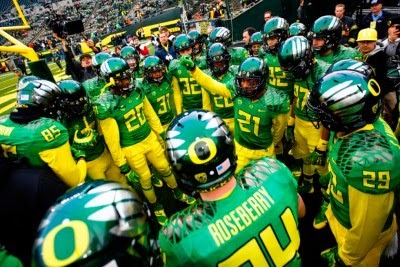 Oregon Ducks Football Week Two: College Football Playoff Preview? These teams have very little history together. You have to go back 15 years to the last time they met, and 16 years for the last time they met at Autzen Stadium. The Ducks won that day on the strength of four first-half touchdowns from Akili Smith, whose quarterback coach (and the Oregon offensive coordinator at the time) was one Jeff Tedford, the next hot up-and-coming coach. The names Reuben Droughns and A.J. Feeley also loom large in the Oregon-Michigan State games back then. But that was then and this is now. The Spartans are coming off their best season in some 50 years, their first Rose Bowl win since 1988, and the most wins in one season in school history. The Ducks didn't make a BCS Bowl for the first time in five seasons (although they should have), didn't beat Stanford for the second straight year, and on top of that had a really bizarre shellacking at the hands of Arizona when the division and the conference championship- and a meeting with Michigan State in the Rose Bowl- was in their sights. I know nothing about these two teams yet, and neither do you. Last week, the Ducks put a thumping on South Dakota, while Michigan State beat up on Jacksonville State. They are both very good teams. The winner will be an early front-runner for inclusion in the College Football Playoff. The teams have met a total of four times, and the home team has won all four times. So Oregon has that going for them. No matter what happens, the team will be discussing this game the rest of the season. It will either be discussed as the game that propelled them to a great season- or signaled that for the second year in a row, they're good- but not that good.